2nd Battalion, 14th Marines (2/14) is a reserve artillery battalion comprising three firing batteries and a headquarters battery. The battalion headquarters is based in Grand Prairie, Texas. As of 2006 the battalion has become the first fully operational HIMARS battalion in the Marine Corps. Fox Battery, based in Oklahoma City, OK. was deployed in July 2007 in support of Operation Iraqi Freedom, and has the distinction of being the first Marine Corps HIMARS battery to deploy into combat. The 2/14 was reactivated on 1 July 1962 at the Naval and Marine Corps Reserve Training Center in Dallas, Texas. 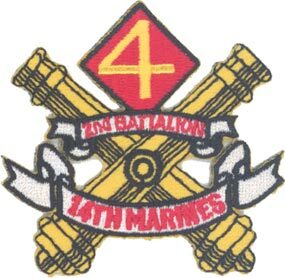 In February 1966, the 2/14 was assigned to the 4th Marine Division, USMCR. They relocated to Fort Worth, Texas in 1988. The battalion participated in Operation Desert Shield and Operation Desert Storm, Southwest Asia, November 1990-April 1991. 2/14 has additionally deployed batteries in support of Operation Iraqi Freedom and Operation Enduring Freedom.